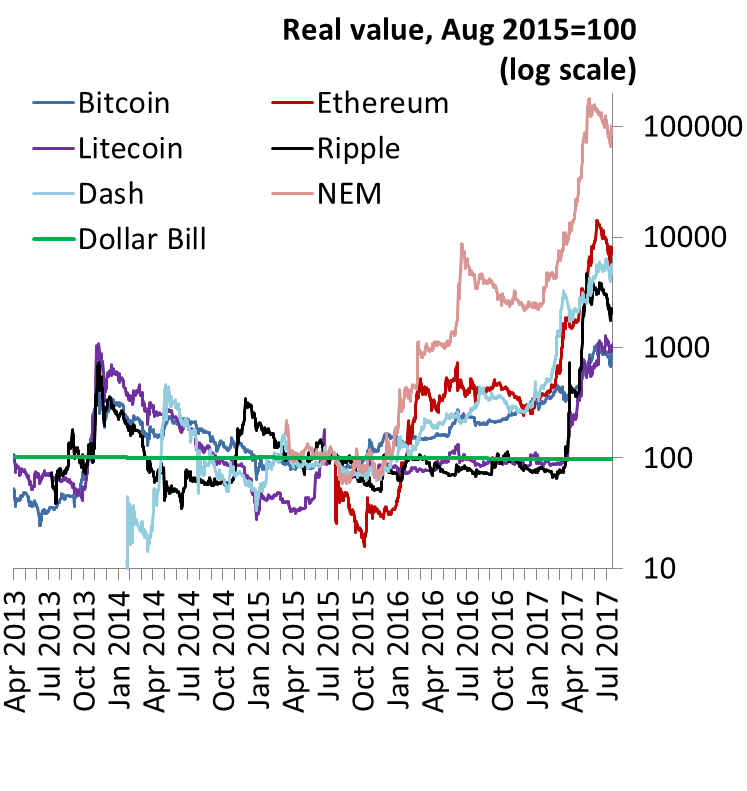 This chart plots the purchasing power of five leading cryptocurrencies vs US dollars- obtained by dividing their dollar exchange rate by the US CPI deflator. Whilst their real value has generally risen, large falls in their USD exchange rates are common, and overall their value is highly volatile. Existing cryptocurrencies have generally failed as stable stores of value. Conversely, inflation risk of fiat currencies can be largely eliminated by inflation targeting and holding interest bearing deposits. This extreme volatility also limits these cryptocurrencies’ attractiveness as a means of deferred payment or a unit of account. Who would want to lend or borrow in a currency with such an unstable value? Though lenders might gain from appreciation, few prospective borrowers earn income in cryptocurrency and so lack a hedge against devastating exchange rate swings, risking default. Keeping accounts and/or managing payments in cryptocurrency over time is problematic because of wildly fluctuating exchange rates. Explanations for cryptocurrency volatility abound – perhaps it’s market thinness, bubble dynamics, difficulty of pricing, uncertainty, hoarding, frenzies around initial coin offerings or something else. But unless and until private cryptocurrencies can achieve stability in real terms, they will struggle to complete with central bank issued money on any meaningful scale. John Lewis works in the Bank’s Research Hub Division. Next Post Who withdraws money from distressed banks? I am no a fan of Crypto currencies. Who and what backs them? Crypto Currencies have a history of disappearing, refer to such cases. I prefer GOLD as an alternative to the USD. Real Physical Gold not paper Gold. If you own Gold make sure you have it under your direct control.